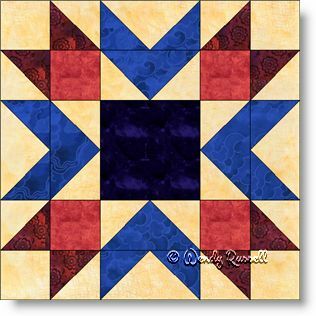 The Blueberry Pie quilt block is a nine patch block featuring half square triangles and flying geese units -- very commonly used patches in quiltmaking. Placement of these patches gives you a star as the main feature. This block is in no way difficult to construct, but due to the number of actual cut pieces, you must be careful to sew an accurate quarter inch seam allowance in order that your seams line up properly. For this reason only, I have added Blueberry Pie to the category for intermediate level of difficulty. You will note that the two sample quilts illustrated are similar, but subtle changes give each an entirely different look from the other.